It has taken me way too long to make a video that I feel is passable. Please critique, as I look forward to learning from others. To my mind it is a nice video and a good Shii-Cho's Dulon execution. If I may, I notice some minor details. I'm French, so, in advance, sorry for the mistakes in grammar and verbs (and terms !!!) I can commit. - on the second Sun Djem Sai, I think you can enhance the part of the strike for disarming the adversary. 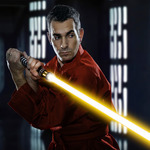 You need also to end with your Saber blade parrallel to the ground (this point is ok in the video) but the blade also need to be in the same line as your shoulders and hips (in the video, the quick of your Saber go too far away of this line). - A new thing I only learned this morning, is that there is a Cloud Sword, not a basic Circling over the head, before the Cho Strike to the left at the neck (the first strike after the half-turn). But before this morning I think it was a circle over the head, and in the Shii-Cho video by Master Nonymous, it is a circle over the head. - Before the two Honor Sash (Cho), you can make a downward orbit to your left. I'm not sure that these orbits are mandatory. - The first Upward Orbit, for me, is on the other side of your body (you make it in your video to your left). In the video from Master Nonymous, on the 3 appearances, in the first one the Orbit finish on the right shoulder and in the two others on the left shoulder. So I opt for an upward orbit to the right finishing above left shoulder. But, I repeat myself, great video and great work ! I have no graduations at this time and I'm currently training on this specific Dulon. My training on it is not terminated. So, take my comments only as comments . Masters or Knights will give their own advices. As lambeaux says, we are currently working on a text transcript of the Dulon Shii-Cho of the TPLA system, so that the French students of the system have a referenced document. We wish, with lambeaux, to validate this document to the Headmasters of TPLA so that it can serve to everybody. We are looking for appropriate terms and words in french to translate those of the system. The people you see on the private video below, work on the form we have transcribed from Dulon's reference of Master Nonymous. Hopefully you will be able to answer the points raised by lambeaux. When watching me executing the Shii-Cho's Dulon, I see that I need more practice ! And I have some (and others ^^) details to correct myself. I'm the Kai-Kan of the center (on the two lasts Dulon). Thanks again to Darth Cervall for the video. You just have to work on the Formula first, my dear Lambeaux! slide, full step, threee phase step. the come from them: High, Middle and Low. I will record you at the beginning of december to make your first video for your Initiate Achievement Submissions. Thank you both for your input! I've been following the cloud sword changeover closely, often referenced in the videos with a "Bespin" header (Bespin Spin,Bespin Canopy) and until recently the beginning of the second trajectory was around the head, or appeared so as you said. From a literary standpoint around the head would work, since Shii-Cho and light sabers were used to clear battlefields of enemies that had no way to block. From a sparing/dueling standpoint it makes more sense to keep your blade between you and your opponent, and I believe it to be a better application for the system. Let's see your formula, too, Deoss! This is always the first step, though I like your dulon. It's in the initiate forum. Yes, I know. I had posted an apology here when I realized my mistake, but obviously it got lost in the void. Sorry again! All good. I appreciate the lookin' out! I thought you can repeat trajectory one but you can't I am just doing the accelerations which didn't know terra prime have great system so they correct me and I am from the uk I can't get to there Academy so there's people on what there doing thanks master Nero and to videos that master nonymous does so yeah great exercises.